BOSTON, MA--(Marketwired - Oct 13, 2015) - With the emergence of data analytics tools and new software-enabled hardware, building energy management services (BEMS) have expanded in capability. BEMS have benefitted from $1.4 billion in venture funding and falling costs to facilitate operational decisions based on analysis of building energy data, according to Lux Research. 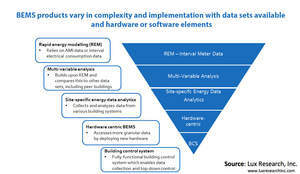 "Customers view energy analysis tools across the BEMS spectrum as intelligence tools, and thus companies need to remove the capex hurdle and price them using an approach like Software-as-a-Service (SaaS), amortizing the hardware to keep costs competitive," said Alex Herceg, Lux Research Analyst and lead author of the report titled, "Beyond the Walls: Benchmarking BEMS Software and Hardware." BEMS enjoys robust venture funding. BEMS developers attracted $1.4 billion in venture capital funding from 2000 to 2014, about 26% of all investment in building energy technology domains. A third of this total was in software, 27% in energy services, 25% in sensors and controls, and 13% in semiconductors. The report, titled "Beyond the Walls: Benchmarking BEMS Software and Hardware," is part of the Lux Research Intelligent Buildings Intelligence service.